About - Our Guide to Surrogacy in the U.S.A.
A photograph taken when our babies were 3 weeks old in Sedona, Arizona of my fabulous husband and our amazing children Alexander and Liliana. 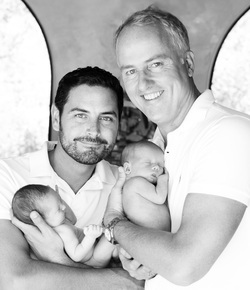 Richard and his partner Steven undertook surrogacy in the United States and learned everything about the process during the process. Since the twins were born, Richard has become an advocate helping prospective parents (both gay and straight) learn more about surrogacy in general but predominantly about doing it in the US. In doing so Richard aims to help parents make informed decisions from the outset which should hopefully save them not only a lot of hassle but also a lot of money. Richard has always had a fascination with biology and on the back of his experiences and his advocacy work he now also helps US fertility clinics in the UK reach out to prospective parents. Richard's basic step-by-step guide featured in the We are Family Magazine Winter 2013 edition. Richard is also actively involved within the UK gay dads community in organisations such as GaySurrogacyUK and Families Thru Surrogacy.